There’s more you can do with Del Monte Quick n’ Easy Italian Pizza Sauce than just regular pizzas. 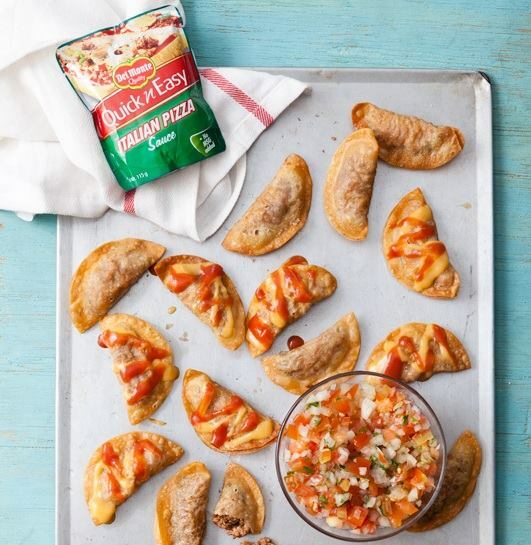 Broaden your #KitchenQueen prowess with the recipe for Fried Ravioli with Tomato Salsa. This will surely impress your friends and guests. 1. Sauté ground beef with garlic in hot oil. Add Del Monte QNE Pizza sauce, basil and rosemary. Season with 1/8 tsp pepper and 1/8tsp salt. Remove and allow to cool. 2. Measure ½ tbsp of the meat filling. Fold and Seal the wrapper with water. Set aside in the chiller for 30 minutes to set. 3. Deep fry in hot oil. 4. For salsa: mix all ingredients. 5. Serve while hot and drizzled with DEL MONTE Cheese Magic and pizza sauce and served with salsa.